Last weekend, the hubby and I were joined by my PILs in Bacoor. We drove there on Friday night and headed back to Manila on Sunday afternoon. I was quite productive because I finally got to declutter my closet after ten years, hahaha. Seriously, it felt good to get rid of old clothes and to let go of new ones that I kept for so long because I thought they would fit me again. I admit it was difficult for me to do it but sometimes, hard decisions have to be made. I told myself I’d just buy new ones as a sort of reward when and if I’d be able to lose weight talaga in the (hopefully, near) future. The clothes, both old and new, are to go to Mame’s relatives upon her suggestion. Fine with me. It was just the hubby and me in Bacoor last weekend. We drove there on Friday night and went back to Manila on Sunday night, the longest we’ve stayed in a weekend in our marital home since the last few months. We just enjoyed each other’s company, and went out of the house only when we had to. Like when we heard the mass at the church near our village and bought some stuff at the mall on Sunday morning. The rest of the time was spent doing household chores, getting online, eating, and sleeping. Oh, we also had our Cignal cable subscription replaced with a different one (also with several HD channels) that came bundled with unlimited internet (3 Mbps) because the hubby wanted to and he agreed to pay half of its monthly fee (which is now higher at PHP1,575 because of the internet bundle). Super fine with me! Haha. Last weekend started early and felt longer than usual. The hubby and I had dinner with our Cebu-based friends on Friday night in Alabang and we went home in Bacoor right after. I had two new foodie discoveries in Alabang: Kulinarya Experience or KXP (where our group had dinner) and Café Seol Hwa (where we had coffee and desserts). Both are located at Commerce Center. They don’t just serve good food, but they also have fast service. I know. It’s no longer avocado season (or is it still?) but I just want to write about the homemade avocado ice cream I made one random weekend for posterity’s sake. Haha. This easy peasy recipe only requires three ingredients and four steps to make. This is one insanely good (and healthy, too!) dessert for the entire family! Weekends are full of surprises. This is especially true if it’s a long weekend. The hubby and I were already in Bacoor as early as Thursday night. Of course, we were excited over this 3-day break! Despite the continued heavy rains coupled with strong winds, the hubby and I were able to go out to do some errands, work on his thesis, and visit the wake of a friend’s mother. 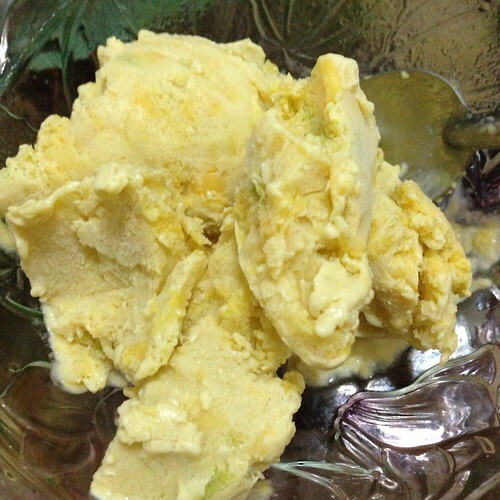 On Thursday night, I made some ice cream using ripe avocados from my FIL’s own tree. It turned out to be so good for a dessert/snack that leaving some for our family in Manila was a hard thing to do. (Don’t worry, we ended up leaving some for them in the name of love.) Haha.